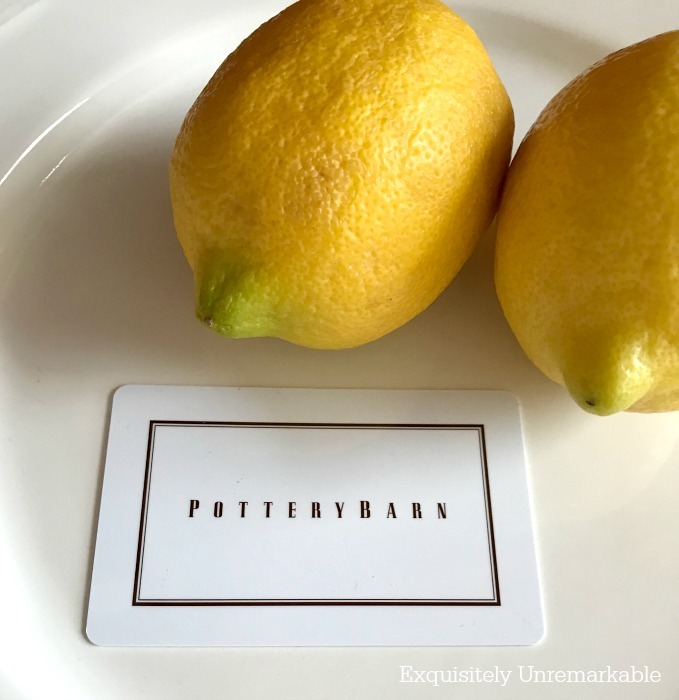 Pottery Barn Gift Card Giveaway! It's March and what a month it's been! I celebrated a big birthday and so did Exquisitely Unremarkable. Five years ago, this month, I began writing in this little space, sharing some of my thoughts, humorous tales and chronicling my DIY and craft projects. I had no idea what I was doing, who I would meet or where it would lead me, but boy oh boy, what fun it's been! I have made so many wonderful friends and been blessed with so many readers who come back year after year, post after post, to see what words I've put to paper. For a writer, what could be better than that? I am truly grateful for each and every visit, comment and email and what better way to express my very sincere thanks than with a little giveaway. 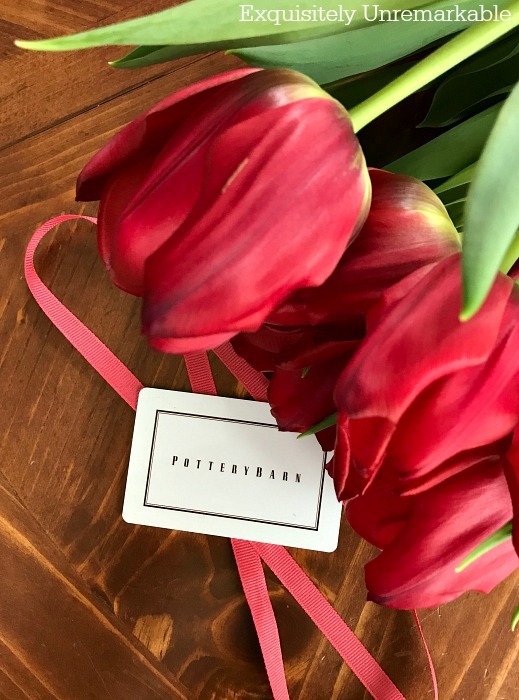 This weekend, while in Pottery Barn, I picked up a $25 gift card to give away to one lucky reader. A little 5th Exquisitely Unremarkable anniversary celebration if you will. How do you enter? Well, we're going old school today. If you are a US resident and you'd like to win, just leave me a comment, with your email so I can contact you. If you aren't one for comments, email me. 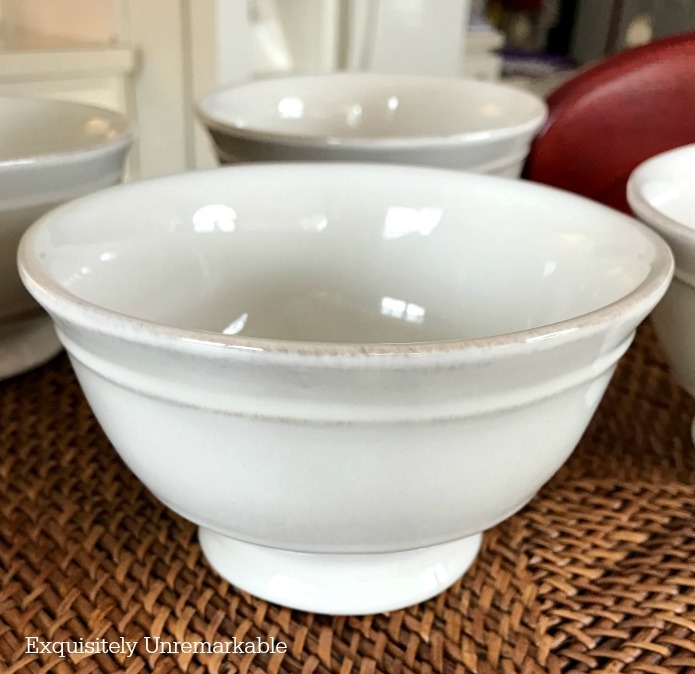 You rekindled my love of milk glass with your last post. Thanks.Happy Birthday & Happy Blog-aversary! Happy 5th anniversary! Hope you had a wonderful birthday. I love your living room with the pops of red. So cheery and inviting. Thanks for sharing! Happy 5th Blogiversary, Kim! I celebrate my 5th in May ;) Thanks for the giveaway! And I already subscribe to your super great newsletter! Thank you! Congrats on your 2 birthdays Kim! I'm a happy Exquisitely Unremarkable reader & follower as you know. Sign me up for the PB giveaway! This is fun! Happy Anniversary/Birthday. I look forward to your postings. Thank you. Happy 5th Anniversary! Always love reading your posts. I am also a subscriber. I already am a reader and follower. Thank you for your dedication to this craft called Interior Design! It is good to know that I can go here for common sense ideas and inspiration when I need it most! Congrats Kim on blogging for 5 years. It is amazing the peeps that we meet in blogland. Without this crazy place called blogland we might never have connected. You are warm, funny and such a great writer and DIYer so it is always fun to read your posts. Thank you sweet friend for sharing your friendship. That is a wonderful gift you share. You are too sweet to get a gift card from Pottery Barn for a giveaway. Just shows your generous soul. Have a good week ahead. Happy Birthday! I'm also celebrating a big birthday this month....but at my age they're ALL big. :/ Count me in for the giveaway. I've been following your blog for years! We have similar styles so I'm always excited to see a new entry from you. Congratulations. I look forward to your postings, knowing I will get a laugh or a smile for my day. Happy Five Years Kim!!! It has been a pleasure, learning from you and getting to know you. Our mom to mom chats mean so much to me. I do appreciate them so much. Here is to many more years of writing and sharing your creative ideas with us. Congratulations on both your birthday (cannot be too much of a biggie) and your blog-a-versary! You are so sweet to do such a fun give-away. I'm signed up for your newsletter. Wish I could send you some AZ warmth and sunshine! That's so sweet, Kim! Congrats on five years! I'm glad I found your blog, I love sharing our love of cottage style! I recently found your site and I'm now a regular reader. I love your one topic posts and have already gotten ideas! Congrats on first 5 years and hope I will say that again after the next 5. Happy Birthday to you & your blog. Thanks for letting us celebrate with you. Wow - how awesome! Happy belated Birthday! A red letter day! (get it? you love red? umm...) PB is one of my favorite stores, tho I can only usually buy a small very clearance priced something in there! I don't think I am subscribed to you by mail - I keep your blog in my blog's sidebar. My email is gina.cannary@gmail.com. Happy First Day of Spring, too! Happy Birthday and Blog-a-versary! I have been a long-time subscriber of your blog and absolutely love reading it! Thank you for such a sweet and thoughtful giveaway opportunity! Kim, how could it be 5 years?? I found you on AllFreeChristmas Crafts, I think... anyway, your living room was my screensaver for quite a while! From there I fell in love with white couches. And othe Exquisetly Remarkable stuff you do! Thanks for 5 great years. Happy birthday, too! Looking forward to 5 more years of emails. Happy belated birthday and congratulations on five years. I am subscribed. The thing that brought me to your blog was that big red wreath. I love it. A gift card to Pottery Barn would cheer me right up. Here is to another five years. I never comment but I wanted to let you know I love your little bungalow. You inspire me with all your crafty things and your clever writing of your stories. You make me laugh. Keep on doing what you are doing. I will keep coming back. Happy Birthday and thank you for your blog. Hi Kim, wow congrats on five years of blogging. I have enjoyed visiting you each and every week and I love seeing what crafts and DIYs you and the hubs are up to! You are so talented and creative and you make your home decor, crafts, and DIYs seem so easy to accomplish. I am so glad we met through blogging and wishing you more fun years of blogging in the future. Thanks for this awesome giveaway too. Happy anniversary and birthday! I can’t believe how beautiful the plates turned out which look like milk glass! I love to win the giveaway since I’m spying some pink plates from Pottery Barn! Congratulations Kim on your blogaversary! It is amazing how the years pass by, and when you look back, it has been such an incredible journey! I'm so thankful that our paths crossed, your writings have been a blessing, and an inspiration to me many times! How special of you to offer up such a lovely gift to celebrate your blogaversary. Seeing as I won your last giveway, (such a fun one it was!) you don't have to enter me in this one, but I did want to congratulate you and just let you know how glad I am that we have become blogging friends :) Hugs to you today sweet friend! I'm one of those very, very few people who's never been to Pottery Barn. What a special treat it'll be for me! I've only received your e-mail notices for a couple of months, and am very pleased to have discovered your Exquisitely Unremarkable blog. I love your blog title, BTW. My e-mail address is cindy_craw1956@outlook.com. Happy Blog-a-versary! The dishes look great and, yes, I subscribe. I am a happy newsletter subscriber of yours! Love those dishes and it's a reminder that I need a new set. I already subscribe to your newsletter and truly enjoy it. Keep up the writing and inspiring! Happy belated birthday. Hope you had a blow out celebration. Love your style, girl! Congrats! On 5 years Kim! Thanks for the chance to enter. I do subscript to your blog, love all the info. you share!! Awwwww...you are so generous. I love the giveaways from back in the early days of my blogging. Not for the gift per se, but when I was picked, the gift came wrapped and with such a creative touch in a card, or tag, or handwritten note. A 'Real' feel from the person I never met. Good luck to al! I'm subscribed to your blog and love to follow your thrifting adventures! happy blog-a-versary! Would love to win that PB giftcard! Congrats on 5 years my friend! It's been fun navigating this journey with you. How much fun is this!!!! Congratulations on the blogaversary and I also hope you had a lovely birthday!